Speed-linking few notable sites and articles across the web on Sufi Poetry, their background meanings and on Sufi Poets. [::] Sufi Master Inayat Khan's writing on Sufi Poetry, Poetic Imagery is a good place to start with. From his writing "Sufi poetic imagery stands by itself, distinct and peculiar in its character. It is both admired and criticized for its peculiarity. ... These free thinkers of Persia, with their dancing souls and continual enthusiasm, began to express their souls in this particular imagery, using words such as 'the beloved,' 'wine,' 'wine-press,' and 'tavern.' This poetry became so popular that not only did the wise benefit from it, but also the simple ones enjoyed the beauty of its wonderful expressions, which made an immediate appeal to every soul. No doubt souls who were already awakened and those on the point of awakening were inspired by these poems. Souls who were opening their eyes after the deep slumber of many years began to rise up and dance." read here. more writings. [::] One of the most comprehensive web resource on Sufism and Sufi theme is maintained by Dr. Alan Godlas at University of Georgia. His page on Sufi Poets and Sufi Poetry has a good deal of information. "Sufism and the encounters that Sufism facilitates - encounters with God, love, and the deepest aspects of human consciousness - have evoked feelings in Sufis that have poured out through their ravaged hearts onto their lucid tongues, providing us with some of the most beautiful and profound poetry ever written." visit here. [::] Whenever classical Persian poetry is discussed, the subject of the symbolism and meaning of its images is bound to arise. The article in The Muhyiddin Ibn Arabi Society talks about Jami's Symbology on Divine Love and the image of wine. read here. [::] Poetry Chaikhana has a introduction to Islam and Sufi Poetry with works from eminent masters. Also you can browse the Sacred Poems on different theme here. [::] Seeker After Truth has a nice article by Hossein M. Elahi by the title, Poetics and Aesthetics in the Persian Sufi Literary Tradition. good read. Also check other entries on Sufi Poetry. Western Encounters with Persian Sufi Literature by Farhang Jahanpour is another article worth reading. [::] A wonderful Interview with David Fideler on Sufi Poetry and on his latest book Love's Alchemy where he address quesions such as How did Rumi ever become the best-selling poet in America or what makes Rumi so popular? Answering the important question, what kind of message do you think the Sufi poets have for us today, as modern people living in today’s world? David Fideler responds "I think that people are incredibly hungry for a deeper vision of human nature than is offered by, or even recognized by, American culture. It’s probably safe to say that we have developed the most self-centered kind of psychological outlook ever seen in human history - and the perspective of the Sufi poets is directly opposite to that. When we start having experiences of depth in our lives - and develop the ability to no longer identify with the socially conditioned ego - that’s an opening, and an invitation to discover who and what we really are. Another thing that people resonate strongly with is the Sufi view that there is an underlying, divine unity that binds all people together, despite the outward differences of religion and culture. That’s something that many of us instinctively realize and feel, but no one says it better than the Sufi poets - and they were saying it hundreds of years ago". read the full interview. its very rich. [::] Spirituality Practice has a lovely section on Sacred Poetry. [::] Salonim has a nice article by Ali Alizadeh by the title, Confused About Sufi Poetry? The article takes on the rise in the contemporary mainstream Western readers’ interest in Sufi poetry which he points at the same time potentially positive, and yet paradoxically dubious. 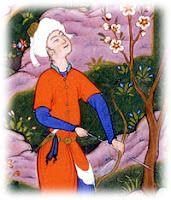 [::] The Arab World Book website has an article on Sufi Poetry and selection from Rumi's Masnawi (A. H. 670). "The very essence of Sufism is poetry, and the Eastern Mystics are never tired of expatiating on the 'Ishq or "love to God," which is the one distinguishing features of Sufi mysticism"